Mr. X spends hours at a stretch to write a blog post. A visitor comes to his blog, reads the first few paragraphs and hits the back button to never come back again. Trust me; it is really disheartening. The fact is, most bloggers find it difficult to write a perfect blog post that keeps their visitors engaged and make them read through the end. And I won't be surprised if you belong to the same league. ...a boat with a big hole at the bottom that almost sank my blogging career. It took me months of research before I was able to plug that hole and devise a simple yet effective formula that kept my readers engaged. A formula that worked every time and for every type of blog post. What if I say, I am going to share with you the exact formula that worked for me? So let's get right into it. Writing a killer blog post may seem like a rocket science, but it is not the case. By following these simple and actionable tips, you can make your readers fall in love with your blog post. Before you even start thinking about a topic for your blog post, you must gather all the information about your readers. But Aquif, what's the relation between writing a good blog post and knowing your readers? Let me explain to you with an example. You have delivered a fantastic speech on Advanced SEO Strategies at an event attended by top SEO professionals, and many experts have appreciated the same. Do you think the same script will work for your next seminar at a college event? Of course, not. You will have to focus on basics of SEO while addressing college students. Blogging is no different. While writing your blog post you must make sure you understand your reader's skill set, else your readers will feel left out. You also have to make sure you use the correct words while addressing your readers. So, if you know your readers, you can adjust your writing style, your choice of words and other aspects of writing to make sure you connect well with your audience. What is the age group of your readers? Are they from a specific location or scattered around the globe? How knowledgeable are your readers about the topic? Getting information about your readers will be easy as pie if you are using Google Analytics. If you are not using it, then I suggest, you start using Google Analytics today. To get the desired information just log into your Google Analytics account and head over to "Audience Insights" section located under "Audience" tab of your Google Analytics dashboard. 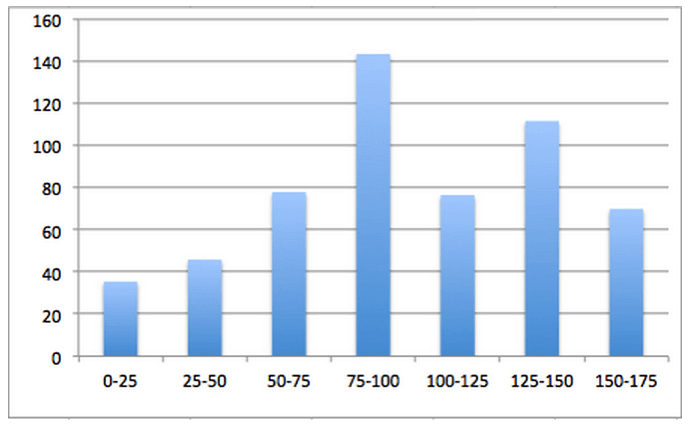 The Analytics data clearly shows that most of my readers are technology enthusiasts males in the age group of 18-24. You can use the "Additional Dimension" option to get more data about your readers. This data includes your visitor's country, city, their language and the device they use among a bunch of other information. Analyzing your competitor's articles will help you find out the kind of content which is popular among your target readers. Remember, your aim is not to copy your competitors. Rather you must figure out how to write a blog post which is better than your competitors. "Google" your seed keyword and analyze all the blog posts on page one of Google to find out the following information. What kind of content is getting more social shares? Is it the listicles or Long form blog posts or infographics? What is the average length of the article? In the case of listicles, what's the maximum number of points your competitors have covered? What queries do people have in the comments section? Is there any important point your competitors are missing out? Make sure to note down all the important points your competitors have covered. Add to it all the queries that your readers have in the comments section and any other additional points your competitiors have skipped. You now have the recipe for writing your perfect blog post. How often do you face this situation? Almost all the time; am I correct? The root cause of this problem is human mind's inability to visualize things. By preparing an outline for your content, you can visualize your ideas and organize them in a better way. Here's how you can do it the easy way. Start by making a list of all the important points that you want to cover in your blog post. You don't have to put it down in a specific order. Just a random draft to make sure you do not skip any important point. You can also integrate this step with Competition analysis as discussed above. Next, classify these points into relevant headlines and sub-headlines that make sense. Every blog post follows a certain order. If you have a blog post recommending a diet plan, it only makes sense to start with breakfast recommendation, followed by the lunch and the dinner. Even this blog post, starts with the research part which is the first step while writing a blog post. It then moves forward with points that people should keep in mind at various stages of writing a blog post. While it may not be a critical factor, it does help your readers grasp the things in a better way. So make sure to reorder your headlines so that they don't look out of place. You must prioritize your points by moving your main points to the top. Only a few people care about the quality of the tires used in the car. So, a review of a car should begin with the review of its engine as it is the most important thing people want to know. Congratulations!!! You have done half of your work. You now have to just expand your ideas to complete a blog post. But before that, you need to work on your blog's headline. According to Copyblogger, 80% people will leave your blog after reading your headline, the remaining 20% will read the rest of your content. So if you cannot write intriguing headlines, chances are slim that people will check out your content. Now, I know picking the right headline is not an easy task. However, if you can understand the psychology of the readers, you can master the art of writing headlines. Step in your reader's shoes and see if the headline really attracts you to read further. Use catchy adjectives and phrases in your headlines. A/B test your headlines to choose the one that works the best. b. Headline Analyzing Tool by CoSchedule rates your headline based on multiple factors related to human psychology. c. Emotional Headline Analyzer by Advanced Marketing Institute analyzes the emotional impact of your headline on the readers. d. Thrive Headline Optimizer will A/B test multiple headlines and pick the one which performs better. You have written a great headline making your readers curious enough to explore your content. But is that all it takes to retain your blog visitors? Probably not; And definitely not when you consider so many websites on the world wide web use Clickbaits to attract more readers. A good headline with a boring introduction is the perfect recipe for disaster. You just have 15 seconds before your readers form an opinion about your blog post. So you must make sure your introduction is as short as short as possible while covering the essence of your blog post. The first couple of sentences of your blog post should be able to grab your reader's attention. Start your blog post with a punchy line, a shocking fact or an intriguing question. How would you spend your time if you had enough money to never need to work again? Remember, people are reading your blog post because they have some kind of problem. The problem could be anything. Mr. A's laptop is broken and so he is looking for a tutorial on how to fix it. 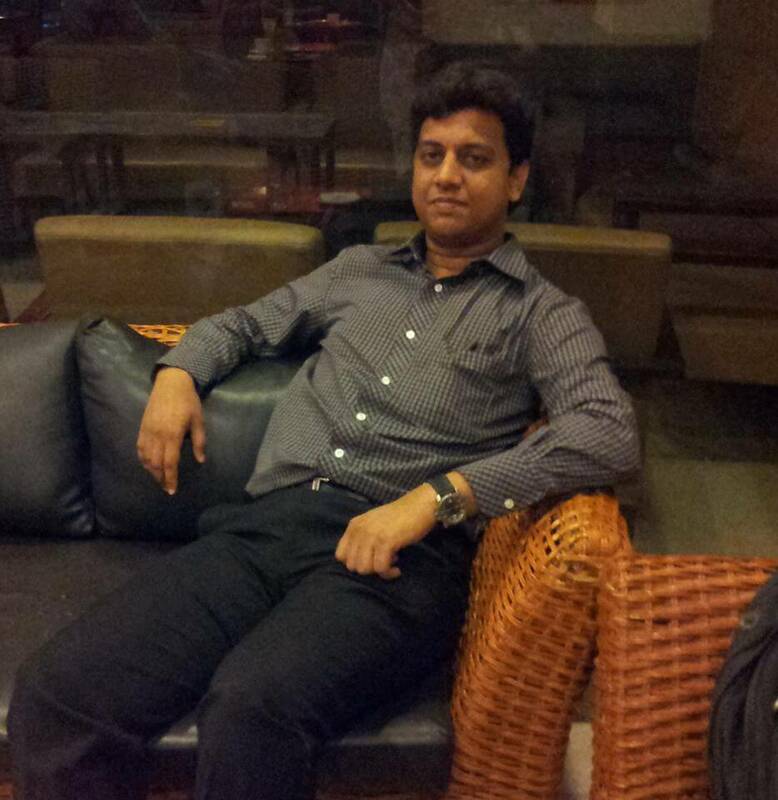 Mr. B wants to learn web-designing and is looking for an e-course for the same. Mr. C is bored and is looking for entertainment. Remind your readers that they have a problem and your blog post is going to be the solution for the same. If your blog post is about "Losing weight," you can tell your readers what it feels to be an obese person. I know it hurts a lot when people pass insensitive comments about your weight. Up until now, you have just made sure that your readers are engaged enough to read the next sentence. In the conclusion part of the introduction, you must tell your readers why they must read your entire blog post. You can achieve this by offering a solution to their problem. Tell them how your blog post can help them overcome their problem. In this blog post I will explain to you, how you can lose 5 kilograms in just 2 months. If you offer a solution right after reminding the problem, people are more likely to accept the same. According to a study, students cannot concentrate on a lecture for more than 10-20 minutes continuously. Researchers have found out that the only way to keep students engaged is to interact with them by asking questions. No wonder, your history teacher asked you so many questions. Things are not any different with blogging. Your readers are your students; they want to learn new things from you. If you restrict yourself to one-dimensional writing without interacting with your readers, they will feel bored and start losing concentration. By asking them the right question, you are grabbing their attention and making them think. And that's what I do with my blog posts. Haven't you noticed how I ask questions at regular intervals to grab your attention? I know, I just used one of them again!!! However, not all questions will give you desired results. So here are a couple of points to keep in mind while asking questions. Close ended questions are the ones which can be answered with a simple yes/no or they have limited set of answers. Question: Hey Sam, are you going out this weekend? Question: Do you like continental or Chinese food? Simply put close ended questions do not encourage discussion and hence they are a bad choice if you want to engage your readers. Open ended questions, on the other hand, will lead to an active discussion. They are phrased in a way that makes your audience think and use their knowledge before answering. Now let us rephrase the above close ended questions to make them open ended. Question: Hey Sam, what's your plan for this weekend? Answer: I'll stay home with the family. I am also thinking about seeing my parents on Sunday. Question: What cuisine do you prefer? Answer: I love Italian food. Indian food tastes good too. So, always prefer open ended question unless you want a specific answer from your readers. Researchers have shown that by asking a question in a particular way you can directly bias the answers. Let me explain it to you with an example. Suppose you are a travel blogger and you want to convince your readers to buy the holiday package you are promoting. Are you ready to go out for a holiday? Trust me, that would be a bad choice because you just gave your reader a chance to decline your offer. It's not that your holiday package is bad, but because your reader doesn't have a reason to go out for a holiday. Now let's see, how rephrasing the question can change things around. After a long and tiring week, don't you think you deserve to go out for a Holiday this weekend? Now, your readers are more likely to check out your package especially if they had a tiring weekend. Try it, it really works. So, make sure to use the right questions at the right place to grab your reader's attention. Imagine, you are reading a blog post for making doughnuts. The author lists down all the ingredients but does not teach you how to use these ingredients to make your perfect doughnuts. Will that be helpful to you? Similarly, by telling your readers "what" to do, you are not helping them. To make your content useful, you must make it actionable by telling them "How" to do it. Below is the example of a non-actionable content. The author does tell you that onions are good for lowering cholesterol but fails to highlight how to use the same in your diet. Or if there are any side-effects if you increase the intake of the onion in the diet. Decide it for yourself, which blog post is more helpful. Check if you are encouraging your readers to take action in the first place. If not, you are doing it wrong. Next, put yourself in your reader's shoes and try to figure out how easy it is for you to follow the advice in your blog post. If you cannot follow your own advice, you must rewrite your article to make it easier for your audience to follow your advice. How good is the below statement? Using SEO, you can get lots of traffic to your blog post. Interesting? Probably not; and definitely not when compared to the below statement. Using SEO, you can double the organic traffic to your blog post, in just 30 days. The first sentence is vague. The definition of "Lot's of traffic" might be different for different people. So it does not give you the exact idea about the amount of traffic you can expect. The second sentence, on the other hand, makes your claim measurable by telling your reader, the exact amount of traffic they can expect to grow and in a stipulated period of time. I wasn't a fan of statistics during my high school and I am sure there are many like me. However, studying statistics is entirely different from reading statistics. Everyone loves reading statistics as they are not a bunch of vague and tall claims but data obtained from carefully carried out studies and experiments. The top bloggers around the world, use statistics to back their claims. Neil Patel uses statistics extensively which is one of the many reasons his blog posts are so popular. In fact, several top blogs have dedicated blog posts that cover statistics. Below is the screenshot of a blog post by WordStream on various Social Media Statistics. As you can see, the blog post has received over 2000 shares which indicates how much people love statistics. 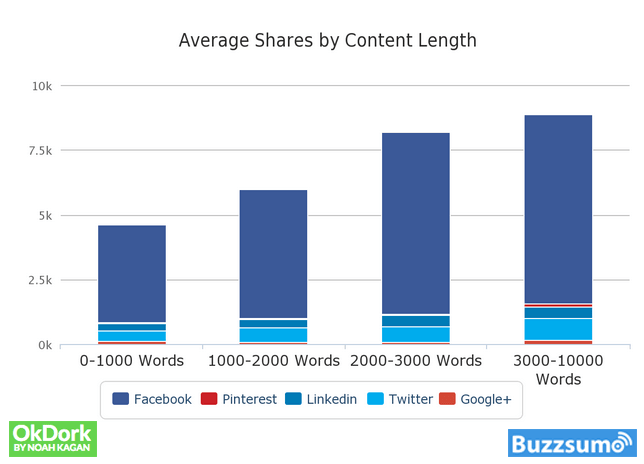 According to an analysis carried out by Buzzsumo and Okdork on 100 million blog posts, long and detailed blog posts receive more social shares than shorter ones. Similar findings were reported by Buffer who carried out a content audit on their blog posts. 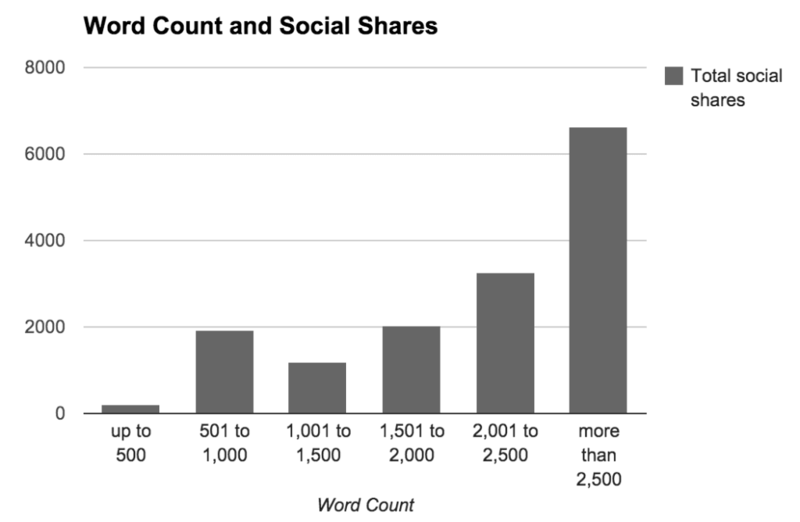 According to the audit, 2500+ words articles get more social shares. But before you jump to the conclusion that you must always write long-form blog posts, let us see the other side of the coin. According to Forbes, after 750 words, or sometimes after only half that, you risk losing your reader’s attention. So you must avoid stretching your blog posts just to increase the word count. This is because writing detailed articles and writing long articles are two different things. As Rand Fishkin has correctly put it in this White Board Friday Video, the length of your content should vary according to the type of your blog post. If you are writing a blog post on a simple informative topic that does not require any detailed analysis, you can make it short and precise. Most informative posts at Searchengineland are around 500 words, yet they have a lot of followers. On the other hand, if you are writing listicles, you must include as many points as you can to make your article more useful to your readers. You must write detailed articles, wherever applicable, in as fewer words as you can. How good would be your Biology Textbook without any images? Would you be able to understand the circulatory system without seeing an image for the same? I'd be surprised if you can. Same goes with your blog post. By using proper screenshots and other relevant images, you are making it easier for your readers to understand the message you are conveying through your blog post. This is because most of the information that comes to the brain is through visuals. Images help the reader scan through your content and grasp the important information in a single glance. Images also make your blogs visually appealing. Researchers found that color visuals increase the willingness to read by 80%. This is the reason blog posts with lots of pictures attract more social shares. A study carried out by BuzzSumo on 1 Million plus articles supports this claim. According to the study, articles with an image once every 75-100 words received double the amount of social shares as compared to articles with fewer images. All these data suggest that images form an integral part of any blog post and it is, therefore, imperative to use them at appropriate locations. Unlike most people think, using images is not all about using stock photos. Rather, you should use various types of images selectively. 1. Stock photos are good for Fashion Blogs and Travel Blogs. 2. Screenshots are best for Tutorial blog post as they help you reader grasp things quickly. 3. For entertainment blog posts, Giphy Images and Memes are a good way to engage your readers. 4. Bar and Pie Charts should be used for blog posts that are backed with statistical data. 5. If you have the budget, Infographics are the best way to convey your message visually. And the best part is they work for every niche. 1. Pixabay has a great collection of high quality Public Domain photos. 2. Pexels is another website which provides photos with Creative Common Zero (CC0) license. 3. Canva is a free image editing tool that can help you personalize your image in quick time. What if I told you that Ethiopia is the World's fastest growing economy? Would you believe it? You will probably think that Aquif is crazy. But what if I use the reference of Business Insider for the same? Or even better, reference of Central Intelligence Agency? I am sure, you will be compelled to believe me now. That is why, as a blogger, whenever you make any claim, it is very important for you to cite the sources. By backing up your claim with references from trustable sources, you are adding credibility to your content. 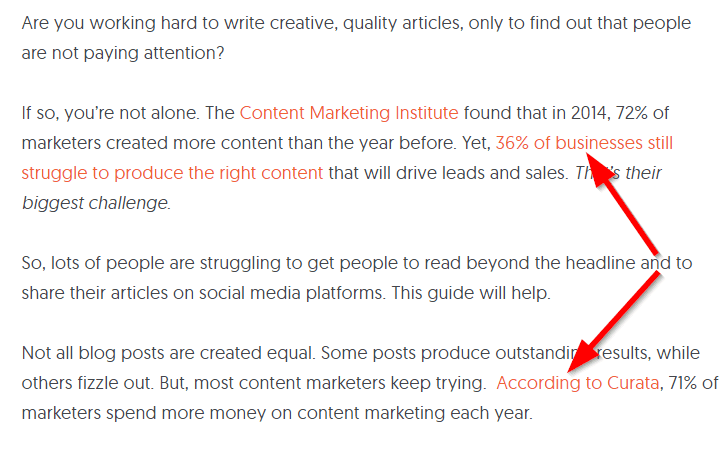 Poor formatting is one of the main reasons people quit reading a blog post. No one likes to read large blocks of texts without any formatting. By organizing your blog post, you are making it easy for your readers to scan through your content. Below are the tips you must keep in mind while formatting your blog post. Break your text into small paragraphs of 2-5 sentences. ​Prefer short and precise sentences that are easier to understand. ​Use bullet points whenever you are using a list. ​Use bold and italics to highlight important points. Drop stylish fonts and instead, use easy-to-read fonts with at least 14px size. WordPress SEO by Yoast plugin uses Flesch Reading Ease Score to test how easy it is to read your content. It also checks your content for several other factors related to readability and provides suggestion to improve the same. Through your headlines, you promised your reader to offer something useful. You reiterated the same thing through your blog's introduction. But, before you conclude the topic, make sure to be the good guy and fulfill your promise. If you are writing a blog post on “How To Lose 1 Kg Weight in 10 Days.” It is very much natural that your readers expect you to teach concrete ways that will help them lose at least 1 kg in 10 days. You can either suggest them a diet plan or a proper workout schedule. But, by the end of the blog post, your readers must learn a way to take a kilogram off their body and that too, in 10 days time. If you just list down various methods of losing weight and do not focus on the "1 Kg" or “10 days” part, you have not accomplished the purpose of your article. If you make your readers go through so much text for nothing, they will feel cheated and will never return to your blog. Your most awesome content would be useless if you can't drive readers to your blog. Therefore, it is essential that you optimize your content for Search Engines. You must include in your content the right Long Tail Keywords and LSI Keywords with a decent volume and low competition. You must not over-optimize your blog post at the cost of the readability. Ultimately, Google will love your blog post only if your readers love it. Google will love your blog post only if your readers love it. No one likes to read a blog post with lots of grammatical, spelling and punctuation mistakes. Not only it makes your article difficult to read, it also raises question over your credibility as a writer. Excerpt 1: At Blogging Ocean, we help people kickstart their blogging career by providing the best tips on blogging, SEO, content writing, and content marketing. Both of them essentially convey the same message. But in the latter case, I have made some spelling and punctuation mistakes apart from some grammatical blunders. If the above piece of information came from two different writers, whose blog post would you prefer to read? I am sure you have your answer why proofreading your blog post is so important. Find and correct all the grammatical errors. Use the right punctuation marks at the right place. ​Check the effectiveness of your sentence structure and if need be, change it to present your thoughts in a better way. Convert sentences with a passive voice to active voice. You can either manually proofread your blog post or use tools like Microsoft Word or Grammarly which will make proofreading easier for you. The former will only check your blog post for any spelling mistakes and punctuation errors. Grammarly, on the other hand, will also check your blog post for grammatical errors. Grammarly is available both as a free as well as paid version. The free version will take care of all your spelling mistakes and most of the critical grammatical errors. However, if you are writing a blog post in the Education niche or other niches which demand greater accuracy, the paid version of Grammarly should do the trick. It checks your article for advanced grammatical errors including vocabulary enhancement suggestions and genre-specific writing style checks. And the best part is, Grammarly proofreads your article in real-time. So, you can always correct your mistakes on the go. Congratulations!! You've done all the hard work to retain your blog visitor until the very end. But you should not leave it there. Now is the time to reap the fruit. If someone reads your article till the end, it clearly means he is totally impressed with the information you shared. Your visitor is now twice as likely to follow your advice than the time he arrived at your blog post. Summarize the important points you discussed in the blog post in 2-3 sentences. Persuade your readers to subscribe to your blog. Ask them to share your blog post on social media. Provide a link to other useful resources on your blog. Encourage them to comment on your blog by asking about their views/suggestions. If you are still reading this, I managed to make you go through 4300+ words without making you lose the interest. I managed to keep my "Boat" afloat in this Blogging Ocean. If I can do it, so can you. Just make sure to follow all the tips in this article and see the difference in your Google Analytics. Do try these tips and let me know how it works out for you. I love all these tips Aquif. Especially the note about pulling in reader attention spans at the beginning of your post. Gotta do it to make a firm impress immediately. I often share a wild or colorful travel story to lead off my blog posts, and then I draw analogies between these stories and blogging. Surefire way to grab wandering attention spans, pronto. Analogies always work, Ryan. It’s a good way to make things more interesting. As for your writing style, it is indeed admirable. No wonder you inspire a lot of people.